← With hot and humid weather could we see a ‘Spanish Plume’? A severe tropical storm is bringing damaging winds and very high rainfall totals to the Philippines over the coming days as it heads over the island chain. 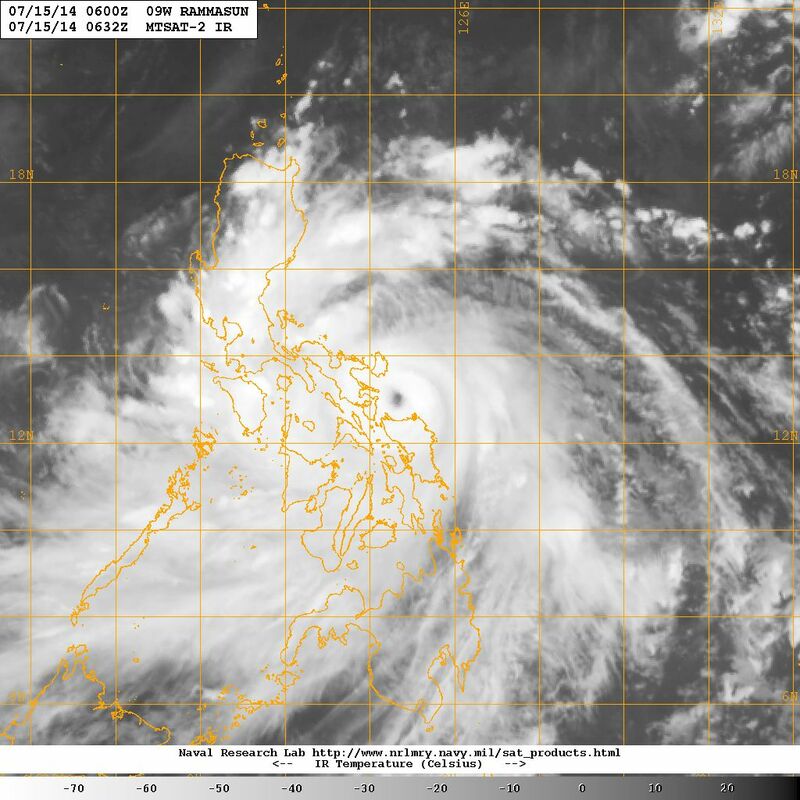 Severe Tropical Storm Rammasun (also known locally as Typhoon Glenda) has already made landfall over the largest island, Luzon, and is expected to track westward towards the capital, Manila. It has winds of about 90 mph and gusts of up to 115 mph are forecast, but these could ease slightly as the storm moves inland. Rammasun will also bring heavy rainfall, with up to 400mm of rain possible over the next two to three days – that’s about a third of the UK’s average rainfall for a whole year. Legazpi in the south eastern part of Luzon had already seen 181mm of rain in just six hours early on Tuesday – this is more than twice as much as the UK would expect in the whole month of July. Satellite image of Rammasun from earlier today. Courtesy of the Naval Research Laboratory. The rainfall could cause flooding and landslides, with the largest impact possibly reserved to the populous Manila itself (Greater Metro Manila Area). A storm surge of up to 1 to 1.5 metres is also expected, coinciding with waves of 3 to 5 metres and spring tides. This could also add to the risk of coastal flooding as the storm passes through. This could be the strongest tropical storm to affect the Philippines since Milenyo (also known as Typhoon Xangsane) hit the area in 2006. The Met Office has been working in partnership with PAGASA, the Filipino national forecaster, to provide high resolution forecast modeling for the region. This can help to provide more detailed guidance and warnings on the potential impacts of Rammasun, helping the region prepare so disruption can be minimised. There are currently no other tropical storms in either the Pacific or the North Atlantic. Official warnings of west Pacific tropical storms are produced by the Japanese Meteorological Agency (JMA). Met Office StormTracker provides a mapped picture of tropical cyclones around the globe with access to track history and six-day forecast tracks for current tropical cyclones from the Met Office global forecast model and latest observed cloud cover and sea surface temperature. We also provide updates on current tropical storms via @metofficestorms on Twitter. This entry was posted in Met Office News and tagged cyclone, glenda, JMA, Manila, pacific, Philippines, rammasun, tropical, Typhoon. Bookmark the permalink. I do like and approve of the cooperative efforts of various national agencies like this; to quote a politician’s phrase out of context, where weather is concerned, “we’re all in it together”.